Estimated average glucose (eAG) or "average glucose" is a newer term you may see reported by your doctor. The American Diabetes Association (ADA) introduced this term to help you translate your A1c tests into numbers that would more closely represent your daily glucose meter readings. To understand eAG, you have to begin with the A1c test (also known as glycated hemoglobin or HbA1c). The A1c test measures the amount of hemoglobin in your blood that has glucose attached to it in the red blood cells (glycated hemoglobin). It tells you what your average blood glucose control has been for the past two to three months. The problem is that the A1c test reports a percentage of total hemoglobin that is glycated hemoglobin. In other words, an A1c of 7 percent means that 7 percent of the total hemoglobin has glucose attached to it. But your glucose meter measure glucose directly in the blood in milligrams per deciliter (for example, 150 mg/dl). The two types of numbers are confusing and few people would be able to easily translate one into the other. Researchers discovered an accurate way to calculate estimated glucose levels from the A1c results. This way you can use the same numbers you are accustomed to seeing on your daily glucose meter readings. Below is a quick reference guide that will help you calculate your estimated average blood glucose level from your A1c result. While the A1c test is important for measuring your long-term blood glucose management, it can’t replace daily blood glucose tests. 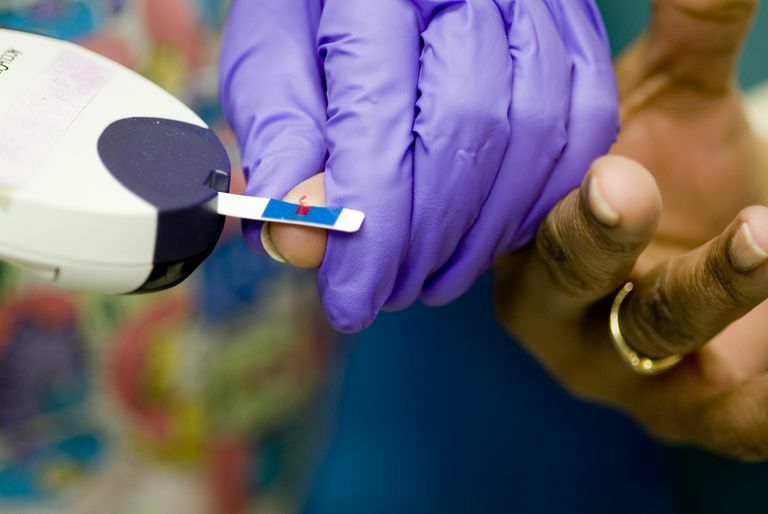 An A1c test won’t give your current blood sugar level. You need that important information in order to adjust your insulin, food intake, and activity level. The A1c is a long-term management tool that should be used in addition to, and not as a substitute for, your daily blood sugar testing. The American Diabetes Association recommends that you get an A1c test at least twice a year and preferably four times a year (quarterly). Most blood glucose meters used for daily testing can quickly give you an average of all the readings over the past several weeks or months. But this average is not the same as the eAG. Even if you test your blood 10 times a day or more, you are only getting a reading of what your glucose is at that moment. In fact, this average from your glucose meter is likely to be lower than your eAG. This is because the eAG represents an average of your glucose levels 24 hours a day and over a much longer period of time. Therefore, it is more accurate. By combining your eAG number with your glucose meter’s average number you are getting a valuable and more complete picture of your overall diabetes management. This will help you in making healthy goals and choices to achieve appropriate glucose control. A1C and eAG. American Diabetes Association. Nathan DM et al. Translating the A1C Assay Into Estimated Average Glucose Values. Diabetes Care. 2008 Aug;31(8):1473-78. What Are the Pros and Cons of Insulin Pump Therapy?